How do you know if your canned food has gone bad? If only it were as simple as checking the expiration date! Sorry friends, but that expiration date is just a recommendation. In truth, canned food can spoil due to many factors other than time spent on the shelf. Dropping your canned food can create a hole or leak that allows bacteria to grow. Storing your cans at the wrong temperature can cause metals to start seeping into your food. Using the wrong methods or improper hygiene while canning will doom your food from the start! This isn’t to scare you into thinking that all canned food is out to give you Botulism. Rather, we want to remind you to inspect your food before taking a bite! 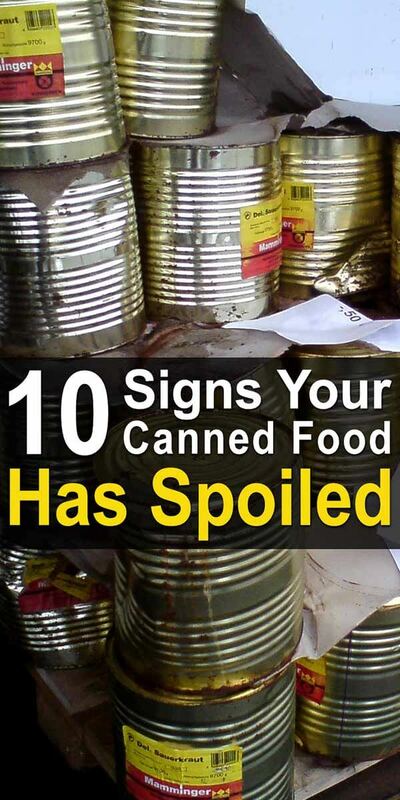 Once we run through the telltale signs that canned food has spoiled, you’ll always know what to look for. Press on the lid of your can. Do you sense pressure or swelling? Or does the lid top “pop” or move up and down? These could all be signs of a serious food hazard! When bacteria breed, they release harmful toxins which cause the tin can to bulge. From these toxins, humans can contract some nasty strains of food poisoning including the most lethal form of food poisoning called Botulism. A soft, brief hissing sound when opening a can is fine–this is just the vacuum seal being released. However, a loud hissing sound is another sign of toxic gas caused by bacteria. If you experience this hissing, stop – do not proceed. If you continue, you risk spreading the bacteria around your kitchen. When you open a can of green beans or tuna, there is always some liquid that pools at the top and spills out just a little bit. That’s natural. What isn’t natural, however, is spurting liquid that erupts like a geyser. This is a red flag that there has been an abnormal build up of pressure inside the can, likely caused by bacteria. When metal cans corrode, metallic chemicals like Bisphenol A (BPA) start seeping into your food while also creating holes that allow bacteria to grow. Corrosion can be caused by improper temperature storage or being covered in soot or ash that moistens the cans. To spot corrosion, look for small rusty holes on the can. When a dent is made on a can, it’s like a mini explosion going off on the inside. The air distribution is suddenly shifted and this can result in the can’s seal becoming compromised. If the seal is loosened, then air can escape and bacteria can enter, affecting both the taste and safety of the food inside. Leaks are the easiest way to tell if your can has been compromised! Don’t just look for liquid seeping out, also check for sticky areas which might be a clue that there was once a leak. If there are holes, cracks, or issues with the seal that are big enough to cause a leak, then your food has been exposed to air, bacteria, and possibly egg-laying bugs that are attracted to the can’s contents. Smell your food every time you open a can. Obviously, rotten smells will gross you out and stop you from eating the potentially spoiled food. But also, acidic or metallic smells will strike you as unnatural. On an evolutionary level, your body is designed to detect “off” smells. Trust your senses! One or two small bubbles on the surface of canned food might just be from the agitation of opening the can. But if you find a light to moderate layer of foamy bubbles, then your food has spoiled. These bubbles are caused by the release of waste or gas from the bacteria that has been partying inside the can. Treat this food like toxic waste and don’t even attempt to taste it. Your food should be the same color going in the can as it is coming out of the can–that’s the whole point of preserving in a can! Discoloration is a clear sign of contamination whether it be from metals, bacteria, or air. You don’t want to ingest that! If there is mold in or on your canned food, it means that your food wasn’t canned properly. The wrong tools or the wrong methods were used which resulted in the growth of mold that has begun to turn your food into mush. In this case, it’s not enough just to scrape the mold off the top because you don’t know what other hygienic or handling issues occurred during canning. Store your cans in a dry, cool, dark place – Ideally, you want a clean storage shed, pantry or a basement that maintains a temperature between 40-60 degrees F. Most homes are around 70 degrees–which is okay–but in general, the lower the temperature, the longer your food will last. Store your cans off the ground – Leaving your canned food on the ground exposes them to condensation, floods, and temperature changes. Shelves are your friend. Physically rotate your food as often as possible – In other words, crack open the older cans first and replace them with newer cans. Don’t let cans of food go forgotten in the back. If you want to learn more about home canning, check out these 9 things to know before you start. Whether you’re stockpiling for the apocalypse, canning for winter, or eating from cans on a regular basis, make sure you really ingrain these signs into your brain! Teach your partner and teach your kids these signs, too. They are survival skills that could save you and your family from enduring a serious illness. Once a can has leaked in the cabinet how can that awful awful ‘spoiled food’ smell be removed from the wooden cabinet shelf? someone told me to do this test: Place the can in question completely under water in a sink or bowl. Wait a minute or two and look for air bubbles coming out from the can. That is another way to make sure of a bad seal.